I just upgraded OpenSUSE from Leap 42.3 to Leap 15.0, and with this upgrade, OpenSUSE moved its default firewall application from SuSEfirewall2 to Firewalld. I opted not to use the susefirewall2-to-firewalld script for migration, but to rebuild my rules from scratch. However, I cannot seem to allow NetBIOS queries to return successfully on my client machine. I have enabled both the samba and samba-client services in Firewalld. What else do I need to do to allow a NetBIOS query to succeed? 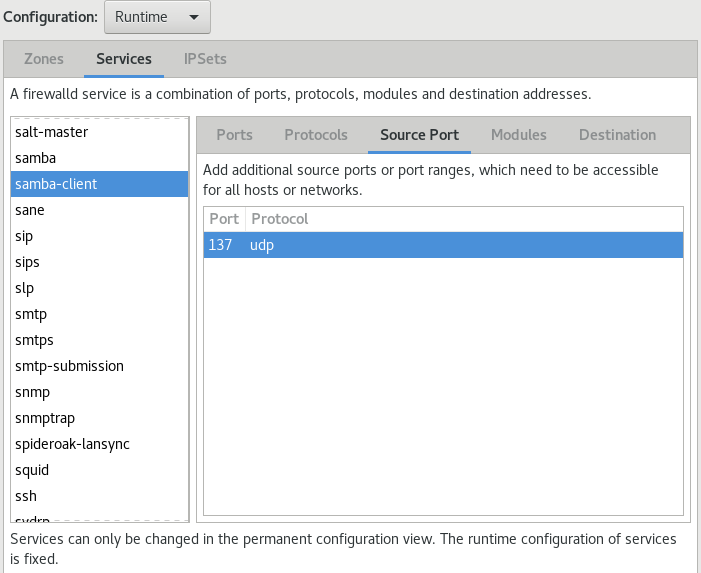 As a result of a discussion about this issue from the Fedora Mailing-Lists, I added port 137 UDP to the Source Port list for the samba-client Service in Firewalld (with the firewall-config tool), which enabled the nmblookup call to succeed. Not the answer you're looking for? Browse other questions tagged opensuse firewalld or ask your own question. How can I allow IGMP-traffic in Firewalld?